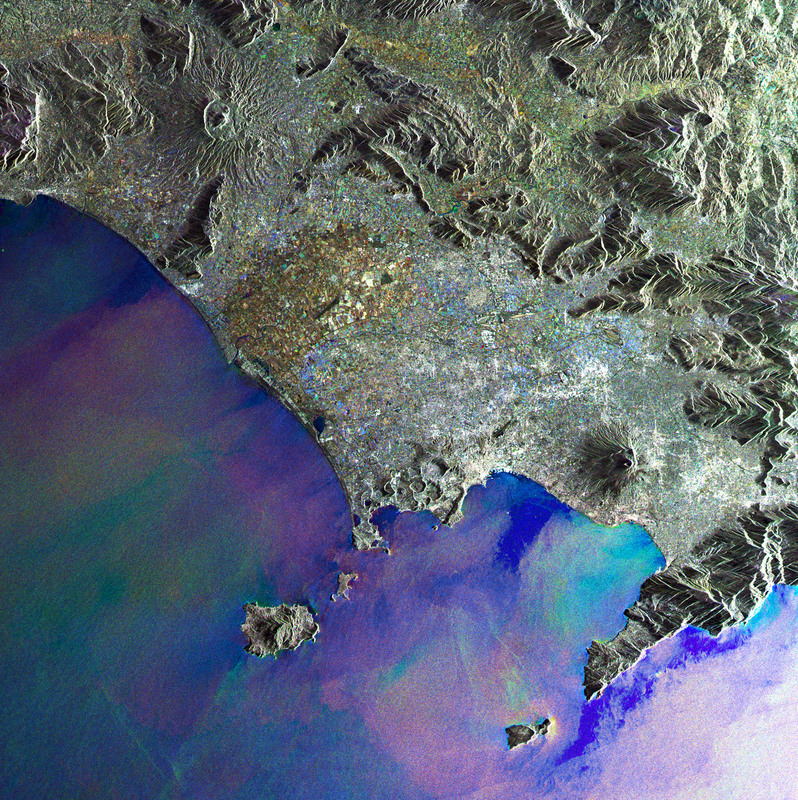 This Envisat Advanced Synthetic Aperture Radar (ASAR) composite image shows the Bay of Naples off the west coast of Italy. The bay is lined to the south by the Sorrento Peninsula – where the world-famous Amalfi coast runs along its southern edge. Just beyond the tip of the peninsula lies the beautiful island of Capri. The islands of Ischia, renowned for its thermal springs, and Procida can be seen to the top of the bay. Mount Vesuvius is featured just inland from the bay overlooking the city of Naples. Google is working with the Group on Earth Observations , which is an international consortium of the world’s space agencies (NASA, JAXA in Japan, ESA in Europe, INPE in Brazil, and many others). The Google Earth Engine is a repository that brings together public Earth observation data (satellite imagery, terrain datasets -also bathymetry ?-, climate information) into a large georeferenced data repository. It is expected that ultimately the Earth Engine will comprise many petabytes. The goal is not only to provide public access to Earth observation data, but also to provide an application programming interface (API) to encourage developers outside of Google to develop applications that use the data in the repository. The Google Earth Engine will provide easy access to the data and a high performance computational platform for geoprocessing. Talisker, the famous single malt whisky distilled on the Isle of Skye has announced its sponsorship of an epic sailing adventure which will be the first to recreate the exact journey of Captain William Bligh's epic 4,000-mile open boat Mutiny on the Bounty voyage. Led by Australian adventurer Don McIntyre and a crew of three in 25ft open boat, the reenactment will follow the journey across the Pacific from Tonga to Timor and aims to raise vital funds and awareness for the worlds first international research institute into Motor Neurone Disease, currently being built by the Sheffield Institute Foundation. Then they plan to set off to sail across the top of the Fiji and the Vanuatu Island groups, before setting course for the Queensland Coast and a landing at Restoration Island following four weeks at sea on light rations. They then sail north inside the Great Barrier Reef to Thursday Island, and across to Kupang and Timor. McIntyre returned to his roots and the roots of Talisker on the Isle of Skye to trace his Scottish ancestry, and hold a Clan reunion at the famous Talisker Distillery. His grandparents Thomas and Mary McIntyre emigrated to Australia shortly after their marriage in 1901 and this was Dons first visit to the island and Scotland. The 54 year-old adventurer, who successfully sailed single-handed around the world in 1990-91 (BOC Challenge), has led a series of expeditions down to Antarctica in 2000, fly gyrocopters 13.5 thousand kilometers around Australia in 2007, brought with him the 25ft replica of the Bounty Boat to give his fellow McIntyres an insight into the extraordinary fight for survival that Captain Bligh and his crew faced following the infamous mutiny on HMS Bounty led by Fletcher Christian. McIntyre and his three-man crew will face the same deprivations as the original Bounty Boat crew, with little food, no charts or toilet paper and only the limited navigation implements that were available to Bligh. They will start the adventure on the same day (April 28th), at the same time and in the same place (some 1,300 miles west of Tahiti, near Tonga) 221 years after the original mutiny journey. By the way, Don McIntyre has loaned Jessica Watson the S&S 34 that is now known as Ella's Pink Lady and Mike Perham has signed on as second in command on the Talisker Bounty boat ! 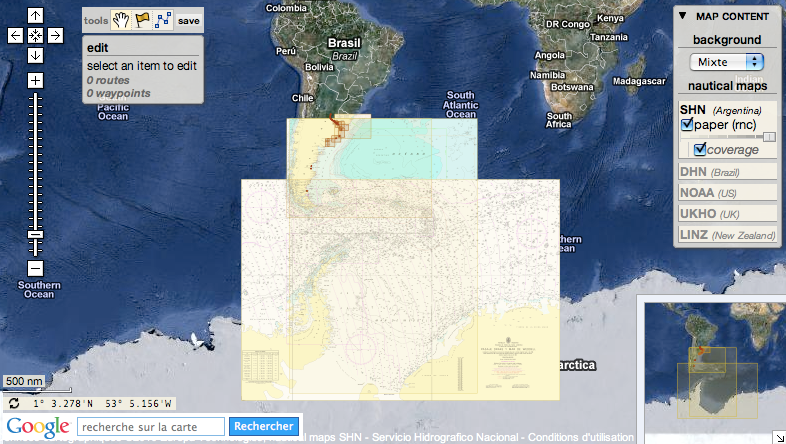 SHN (Servicio de Hidrografía Naval de Argentina) gives us its agreement to display their nautical raster charts (a set of 90 charts) in the Marine GeoGarage. So with the Premium Chart subscription (9.9 € / month), you have access today to both UKHO & SNH nautical charts private layers. Recently the World Sailing Speed Record Council (WSSRC) have discontinued their endorsement of the age records for youngest (and oldest) person to circumnavigate the world, solo, non-stop, and unassisted. Robin Lee Graham (1949 - ) set out to sail around the world alone as a teenager in the summer of 1965. National Geographic Magazine carried the story, and he co-wrote a book detailing his journey titled Dove published in 1972. Graham was just sixteen when he set out alone from Southern California and headed west in his 24-foot sloop. His voyage was also depicted in a film, The Dove (1974). A followup book, Home Is The Sailor, was published in 1983. On July 16, 2009, 17 year old Zac Sunderland (picture above), who cites Robin as an inspiration, became the youngest American sailor to complete a solo circumnavigation since Graham, and the first person to ever accomplish this feat in 13 months and 2 days before their 18'th birthday. As of August 27th, 2009 the youngest person has been officially Mike Perham who grabbed the solo record after completing the 28,000-mile trip, crossing the finish line in Cornwall, in southern England. Perham is a 17-year-old British sailor who became the youngest person to sail around the world with assistance, completing the solo trip in nine months. Abigail Sunderland a 16-year-old American girl has planned the same project. But today, another 16-year-old young Australian girl (4 months older than Abigail) is steering her bright pink yacht to reach her bid to become the youngest person to sail solo and unassisted around the world. Jessica Watson's plan to make a 23,600-mile (38,000-kilometer) journey through some of the world's most treacherous waters sparked a debate in Australia about whether someone so young should be allowed to try such a potentially dangerous feat. Watson and her family insist she is an experienced and capable sailor who has studied navigation, electronics and maritime safety procedures. But is thirteen too young to sail solo around the world? True annual circumnavigators are a few breed that still need to plan their global voyages with many years in advance. To calculate how many circumnavigate the world in a year is a hard thing to do, since not all the attempts are announced, most are not prepare to last a few weeks but instead years that may turn into a whole decade of sea travel. There are families or couples who decide to cut their jobs, put their lives on hold for various years in order to immerse themselves into a world sailing adventure that will take several years, with no schedule and no fixed departing or arriving dates. The first person to sail around the world alone was Joshua Slocum, an American "Blue Nose", from 1895 to 1898, three full years. The second man did it 25 years later; it was another American, Harry Pidgeon, from 1921 to 1925, four complete years of sailing. Between 1973 and 1974, just four sailors went around the world alone (seven sailors did it in 1987, twelve in 1999, fourteen in 2004). The number of sailors attempting an annual circumnavigation are counted down to a dozen. Here world around races are not contabilized because the sheer number of participants are competing, not planning a true and genuine round the world attempt. Recently, one of the UK's most exciting young sailors has confirmed his entry into the oldest solo round the world yacht race – the 2010 Velux 5 Oceans. Nineteen-year-old Oscar Mead will line up against some of the world's top sailors for the 30,000-mile Velux 5 Oceans race which starts in France in October. from pursuing her dream of becoming the youngest ever solo circumnavigator. Remember our link about a petition for creating a Marine Protected Area in the Chagos Island, Britain created the world's biggest marine reserve in its Indian Ocean territory on Thursday, pleasing environmentalists but angering exiled Chagos Islanders who say it creates an obstacle to them returning home. Foreign Secretary David Miliband ordered the creation of a marine reserve, where commercial fishing is banned, in the British Indian Ocean Territory, made up of 55 tiny islands, including Diego Garcia, which houses a US air base. About 2000 Chagos Islanders were forcibly removed from the archipelago in the 1960s and '70s to make way for the American base and have waged a long legal battle for the right to return. Representatives of the Chagos Islanders, who have now taken their case to the European Court of Human Rights, argue that the creation of the reserve will stop them returning home because it bars fishing, their main livelihood. The new "marine protected area" will cover a quarter of a million square miles - an area larger than California - and doubles the area of the world's oceans under protection. "Its creation is a major step forward for protecting the oceans," Miliband said in a statement. The decision by the British government comes weeks before an election that opposition Conservatives are favourites to win. The US-based Pew Environment Group, one of a number of conservation groups that campaigned for the creation of the marine reserve, called Miliband's decision "a historic victory for global ocean conservation". It said the Chagos Islands rivalled the Galapagos Islands and the Great Barrier Reef in ecological diversity and the area was important for research on climate change, ocean acidification, the resilience of coral reefs and sea level rise. SYDNEY (Reuters) – A stranded Chinese coal ship leaking oil on Douglas Shoals, a favourite pristine haunt for recreational fishing, east of the Great Keppel Island tourist resort, which lies off the coast of Queensland state in the Great Barrier Reef Marine Park off northeast Australia, is an environmental time bomb with the potential to devastate large protected areas of the reef, activists said on Monday. The ship was a "ticking environmental time bomb," Gilly Llewellyn, director of conservation for the World Wide Fund for Nature (WWF) in Australia, told Reuters. She said this was the third major international incident involving its owners in four years. Australian government officials say the stricken Shen Neng I belongs to the Shenzhen Energy Group, a subsidiary of China's state-owned China Ocean Shipping (Group) Company, better known by its acronym COSCO. In 2007, COSCO was linked to a major oil spill in San Francisco bay, while last year it was tied to another in Norway, both of which damaged environmentally sensitive areas. "We are seeing a concerning pattern potentially associated with this company," Llewellyn told Reuters. COSCO officials in Australia could not be contacted for comment on Monday. The Great Barrier Reef stretches along Australia's northeastern coast and is the only living structure on Earth visible from space. It is the world's largest coral reef and a major tourist draw. As salvagers struggled on Monday to stop the ship breaking up and spilling hundreds of tons of oil and thousands of tons of coal, environmentalists told Reuters tighter controls on shipping were needed to protect the reef as Australia's energy industry expands. Although only a small amount of the 975 tons of fuel oil on board has so far leaked, Australian officials have warned the ship is unable to move off the shoal unaided, as its engine and rudder were damaged. International salvage firm Svitzer has been engaged and has attempted to use tugs to stabilize the vessel, but the head of the government agency overseeing the operation said on Monday the ship was still moving on the reef. The 230-meter (754-ft) ship was carrying 65,000 tons of coal to China when it ran aground on Saturday with 975 tons of heavy fuel oil on board, a type of oil environmentalists say is particularly sticky and damaging to marine organisms. The ship was off-course and traveling at full speed when it hit, Australian officials have said. If it broke up as feared, environmentalists said the effects could be devastating. "We would potentially be looking at an environmental disaster," Llewellyn said." It would be an extremely large spill." Among the animals affected would be protected species of turtles, dugongs, and marine birds, as well as the sensitive corals, she said. Chris Smyth, an ocean campaigner with the Australian Conservation Foundation, said with Australia planning to expand its energy industry, its government needs to consider whether ships should be traveling through the reef at all. "It is going to actually increase shipping traffic substantially and the likelihood of these kinds of incidents occurring in the future," he told Reuters. This is Australia's third such recent disaster, he said, following two last year, another oil spill off the Queensland coast and a major oil well blowout in the Timor Sea. It should be clearer within the next few days what the likely scale of this disaster may be, Smyth said. In a worst case scenario, the spilled oil could reach protected areas on the Australian mainland, he said. Rescue officials have said the ship will require a long and careful salvage operation, expected to take weeks. Five Arctic states met last Monday in the Canadian city of Chelsea to bolster regional cooperation amid concerns of a military build-up and opposition to the tapping of its rich resources. The meeting comes as a global race for vast oil and gas reserves believed to be hidden beneath the seabed intensifies, raising fears of increased commercial activity spoiling the pristine environment. "Over time, increased access to the region will result in new opportunities and challenges," Canadian Foreign Minister said in a statement. "It is important that we plan now for the future," he said. "Arctic Ocean coastal states are in a unique position to set the agenda for responsible management of the region." Each of the five Arctic nations claim overlapping parts of the region estimated to hold 90 billion untapped barrels of oil. They pledged in 2008 to try to avoid territorial conflicts and balance economic opportunities with conservation of this fragile ecosystem. "Increased development of Arctic oil and gas would not only contribute to the climate crisis that is devastating Arctic communities, it would also add more direct pressure to fragile ecosystems that are already stressed by the combined impacts of climate change and existing development." said Daniel T'seleie a climate change planner for Ecology North on behalf of the signatories. The only alternative to the application of the Law of the Sea Convention (all States involved in the Arctic Ocean continental shelf have ratified the Convention except the USA.) would be a new treaty among only those States concerned with the Artic Ocean sea bed. The precedent for such a treaty is the Treaty on the Antarctic in which 12 countries ratified a treaty to create a legal framework to govern the southernmost continent. Some have presented this Antarctic model as a way to deal with US claims of the coastal shelf of Alaska, as the USA can not use the Law of the Sea Convention bodies. Last week, Obama's new energy plan would allow exploratory drilling in the Chukchi and Beaufort Seas in the Arctic Ocean as early as this summer, although no more lease sales would be held there through 2012. Drilling in Alaska's Cook Inlet would go forward through 2012, but the Bristol Bay area would be withdrawn from consideration through 2017. 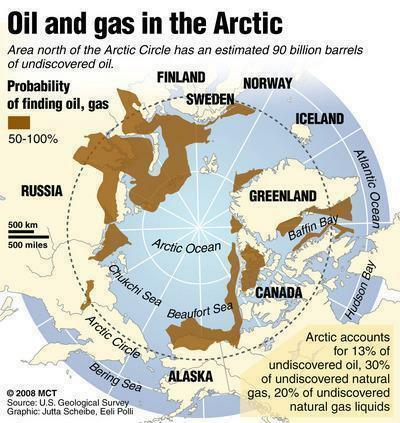 So will the moratorium on all new fossil fuel exploration in the Arctic survive with all this international pressure ? Fifty years ago on last Thursday, 'Tiros I' the world's first weather satellite lifted off from Cape Canaveral, Fla., and opened a new and exciting dimension in weather forecasting. Top leaders from NOAA and NASA hailed the milestone as an example of their agencies' strong partnership and commitment to flying the best satellites today and beyond. On February 1, 2010, the White House announced NPOESS, a tri-agency effort between NOAA, NASA and the Department of Defense, would be restructured. The NOAA-NASA team will build, launch and operate two more polar satellites under the Joint Polar Satellite System. The satellites, planned to launch 2015 and 2017, will handle the afternoon orbit and provide vital information on climate and weather. NOAA and NASA are also working to launch the next generation GOES-R series of satellites, beginning in 2015. These spacecraft will have four times the clarity of today’s GOES and provide more than 20 times the information.